I Adopted Paleo Parents & Got Dark Chocolate Banana Bites As My Reward! 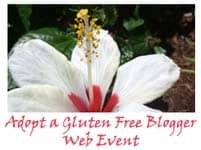 I love participating in Adopt A Gluten-Free Blogger, the monthly gluten-free community-building event created by Sea of Book of Yum. You can read about what adopting a gluten-free blogger is all about in Sea’s December adoption sign-up post. I won’t keep you in total suspense though. Basically it means choosing a blogger who you admire (or are intrigued by) and making at least one of their recipes and then sharing your experience. Note that the blogger either has to have a gluten-free blog or have “searchable” gluten-free recipes. In adopting another blogger, I always learn much more about that blogger and their recipes than I thought possible from a simple “adoption.” I’ve adopted a lot of gluten-free bloggers since I started participating a few years back, and have been lucky enough to be adopted several times myself. Both experiences are true treats! This month I adopted Stacy and Matt at Paleo Parents. I’ve actually been following their blog for the better part of a year now. It’s not just about recipes. It’s not just about the two of them. It’s about their whole family and their paleo lifestyle. You can read their family’s story here and learn about their amazing transformation after removing certain foods from their diet and adding in others. Those who live a “true” paleo lifestyle eat gluten free, grain free, and more-free (e.g., dairy free, legume free). They also include eggs from very happy chickens as I like to say and organic, grass-fed meat in their diet. Of course, eating the paleo way is all about eating real food. You know I’m a fan of that! I don’t claim to be an expert on paleo, so you can certainly learn more at Paleo Parents blog if you are interested in all the details. Stacy and Matt are passionate about living paleo and its benefits, and even host very worthwhile and helpful meet-ups in Northern Virginia. In fact, they just announced that the authors of The Food Lovers Make It Paleo, Bill Staley and Hayley Mason, will be doing a book signing at their next open house event on Friday, January 20. On the other hand, if you have absolutely no interest in eating paleo, please don’t be put off by that label. Paleo recipes are naturally gluten free and grain free, so they often work wonderfully for those who eat gluten free. In fact, plenty of their recipes work for a number of different lifestyles, as shown in their posts on their last Thanksgiving (the plan and the recap) that pleased not only their immediate paleo family, but also their vegan family members in attendance. Their successful “mixed” Thanksgiving is a reminder that we shouldn’t get stuck on labels. I always encourage gfe readers to look at a variety of recipes, seeking the naturally gluten-free ones that appeal or ones that can be made gluten free easily (gfe). I’m convinced that we become better cooks and more knowledgeable about gluten-free ingredients and adapting recipes, when we do the thinking ourselves and don’t simply go for a gluten-free label. There’s room on my kitchen cookbook shelf (and our rolling support group bookcase, too) for all kinds of cookbooks. My friend Bernice at Wheatless and Meatless says she gets inspiration for some of her best vegetarian recipes from checking out meat-containing dishes on others’ blogs. And Renee at Beyond Rice and Tofu always says if she sees chicken in a recipe, she simply substitutes chickpeas; being a chickpea lover, thinking about Renee’s approach always tickles me! Back to my friends at Paleo Parents … I love how they get the whole family involved in meal planning and preparation. In fact, one of their New Year’s goals is to make more time to visit U-Pick farms with their family. That is my idea of quality family time! Their oldest son, Cole—he is the oldest of their three boys at the ripe old age of 5!—is often involved in paleo recipe development. In fact, the recipe that I made and talk about today, Dark Chocolate Banana Bites, is one of his creations. It’s modeled after another delightful treat he invented, Pumpkin Pucks. 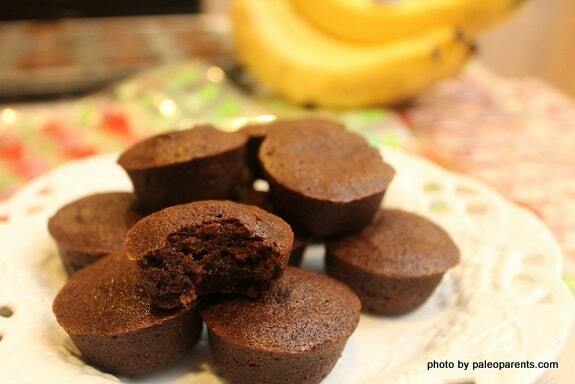 Like the Pumpkin Pucks, their Dark Chocolate Banana Bites are another treat with basic, “real food” ingredients made in a muffin pan. These are two-bite delights or one if you’re really hungry (or have a big mouth … hehe). I made one change to the recipe. I subbed honey for the maple syrup. While I love maple syrup, I was out of it and if you follow gfe, you know that as a family of beekeepers, we always have honey! This recipe is super easy to make just as the Paleo Parents say. And the taste and texture? Beyond what you can imagine. These little bites are pure heaven. When Son bit into one, he exclaimed with a gleam in his eyes, “Oh, man! These are good!” Then he went on to say how much a chocolate-loving friend of his would enjoy them, too. So I packed up a container for him to carry home with him. Fortunately, the recipe makes a lot of these mini muffin treats—several dozen in fact—so I still had a few after he left. I like to follow Paleo Parents’ advice and freeze these on a cookie sheet and then put all into a freezable container. Then I can pull out a couple for an afternoon treat or super special breakfast. Note that the photo above is from the Paleo Parents. I didn’t properly grease my mini muffin pan so my “bites” were not nearly as pretty as theirs. They graciously allowed me to share their photo. Luckily, the fact that my muffins stuck a little did not affect their taste though! The Dark Chocolate Banana Bites are a treat that I will be making time and time again, as I always seem to have plenty of bananas at the ready. These bites are so good as far as the basic ingredients that I think one could even omit the chocolate chips and still love these treats. I plan to try that version soon, and properly use maple syrup, too. 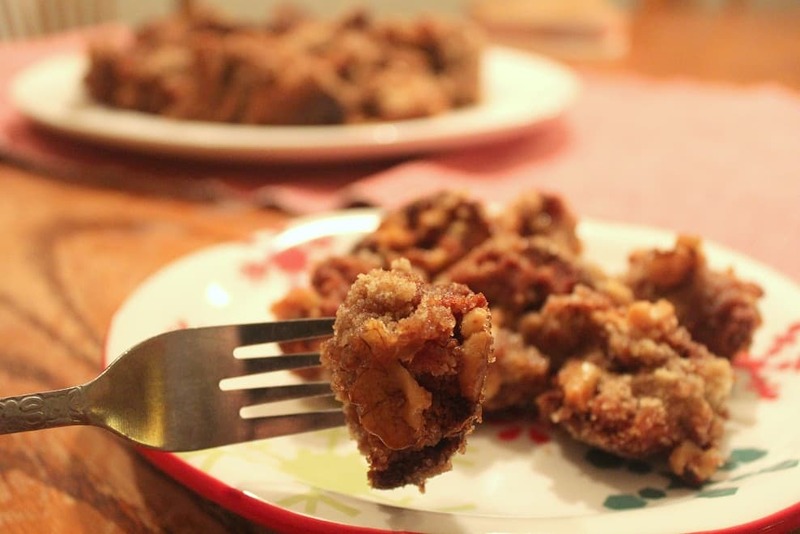 You may remember that Paleo Parents also re-created one of their family’s favorites, Monkey Bread, for our Home for the Holidays … Gluten-Free Style event. I haven’t made that recipe yet, but it certainly looks incredible. Another recent recipe that looked and sounded fantastic was their Caramelized Tomato Eye of Round, and I’ve been wanting to make their Bacon Chicken, too. But I admit that it’s usually their recipes like Pumpkin Bread Pudding and Chunky Monkey Muffins that grab my attention first! So as you can see, their recipes include a wide variety, including occasional and wonderful treats. I’m very happy about those paleo-friendly delights! Stacy and Matt talk about the logic behind the inclusion of some treats in their food plan here, and offer more info on some of the ingredients they use in their cooking and their thoughts on different sweeteners here. There’s also more wonderful info to share about Paleo Parents! In just two months—March 20, 2012 to be exact—Stacy and Matt’s much anticipated cookbook, Eat Like a Dinosaur, will be released. They call it a Gluten-Free Recipe and Guidebook. It’s available for pre-order now. This book is aimed at children and their parents, too, of course, but as I’ve said before when I mentioned it, everyone is going to want to channel his/her inner child to make these recipes. 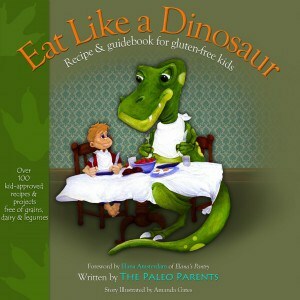 You can read more about Eat Like A Dinosaur on their site. There are even links to many of the recipes from the book here, actually 20 of the 100 recipes I believe. That gives you a chance to “try out” some of the book’s content. Really all their recipes look and sound wonderful, but I think it’s that Grain-Free Granola that’s next on my “Paleo Parents’ Recipes to Make” list. Or maybe the Mini Egg Pizzas. Or the Banana Bubble Pudding. So many irresistible concoctions. Obviously, I could go on and on (and have, per usual). Of course, these are all recipes that your kids can help make, too. If you follow any of the links, you are bound to see the Paleo Parents’ kids in the kitchen delightedly working away with them. They are always in on the action, and the eating! Plus, I’m sure that you’ve already figured out that you’re bound to find a recipe (or two … or six) that you’ll want too make as well! You can see the complete roundup of all the adoptions over at Book of Yum. Final note … since I’m publishing two posts back to back, I hope you didn’t miss my post on my three-year blogiversary—looking back, looking forward, a new blogging event, and a P.F. Chang’s gift card giveaway! Great adoption post Shirley. I found them through your holiday event, and I love their design (as well as their cute book design). I used to make monkey bread and it is soooo good. Dangerously good! I find paleo hard to get into as a vegetarian, but they seem to be the go-to source! Thanks, Maggie! I think the wonderful Paleo Parents have some recipes that will work for you, but understand that there that might not be enough that you’d want to visit their site daily. Luckily, you have me as the “filter” to share their recipes on my gfe Facebook page and label them so that folks might know if they’d work for them. You always pack so much information into your posts, Shirley. Great adoption and thanks for introducing me to a new blog and a new recipe for the paleo-leaning college girl in our family. Off to check it out now. Awesome!!! Those brownie bites would be like gold in my house! Hi Katrina–Always love your enthusiasm, dear! 😉 Paleo Parents also has a sister recipe, Flourless Fudgy Brownie Bites, that you’ll probably find just as delightful. Having tried this recipe though, it will be very hard to beat IMHO! First of all, congrats on 3 fantastic years of blogging – the blogosphere is happy you are here as am I. These look lucious and a great review. I usually stay away from any diet that is “trendy” but Paleo makes sense in many ways and is naturally gf. Great adoption – thanks for introducing me to a new blog! Hi Carol–Thanks so much, dear! 🙂 Such sweet words … I appreciate them! So happy we got to meet in person quite some time ago. It makes your words even more meaningful to me! It’s so weird that Paleo is being seen as trendy, 2 years ago it had been around for a decade (well, millions of years) and no one knew. I think what’s happened is that Cordain and Wolf and Sisson wrote books, a few people did the diet and word spread like wildfire on how great they looked and felt. Either way, I do think that because it is naturally gluten-free, there’s a huge overlap in the community for us all to benefit from one another. Nice to “meet” you over here! Great adoption, Shirley. You are the most thorough adopter and reviewer of anyone I know! Kim–I know you all would indeed love these treats! I sub honey for most any sweetener, but especially liquid ones. 😉 I didn’t know you had made the Pumpkin Pucks. Great to hear your family’s review on those! 🙂 Matt and Stacy are delightful, aren’t they? I can already tell that their book is just fabulous. Such lucky families who you gifted copies to … their Christmas will keep “going,” too. Thanks for the very sweet feedback, dear! I love those dinosaur drawings. Very cute! Although I’m not much of a Paleo person, I know there are lots of good recipes I can “feed” off of on Paleo Parents. These muffins look amazing. No need to be Paleo to enjoy the fun! You always have such interesting blogger friends and “adoptions.” And again, congrats on 3 stellar years of blogging. I agree with Carol, the blogoshere is lucky to have you! We’re lucky to have you! Hi Melissa–Those are the cutest drawings for sure, and I don’t think you’d be disappointed at these delicious mini muffins from Paleo Parents. 🙂 Thanks for the compliment on my interesting friends and adoptions! Also many, many thanks for the sweet words on my blogiversary … you and Carol made my day! i recently discovered you and paleo parents and i am inspired by your creations. so many recipes and people in one post! though we are not on a gf diet, a lot of the daily food we eat is naturally gf. i am also trying my hand at gf yeast breads to help out some friends. Hi Richa–I’m happy to officially welcome you to gfe. 🙂 Thank you so much for your kind words! I know that Matt and Stacy appreciate them, too. Your comment proves that folks on all different eating plans can benefit from looking at others’ recipes for inspiration. There’s no need to limit ourselves at all. 😉 As far as your quest for gluten-free yeast breads, here’s a great bread recipe from Ali at Whole Life Nutrition Kitchen: http://www.nourishingmeals.com/2011/04/gluten-free-bread-xanthan-free-vegan.html I haven’t personally tried it (I don’t really miss bread), but it gets rave reviews! I had this flagged to come back and comment and am so sorry I didn’t find the time sooner. This was the nicest most wonderful write-up. It’s rare to have someone so thoroughly, accurately and wonderfully talk about you. I was thrilled when I saw this and can’t thank you enough. Hi Stacy–I can’t BELIEVE that you came back to take a few minutes to reply to comments while on your 10th anniversary trip to that awesome B&B! I’m assuming that Matt was otherwise occupied at the time because it looked like you two lovebirds spent every precious moment together on your time away. 😉 Saw you have a new post up about it your trip and a decade of marriage (woohoo!!) and can’t wait to read it!